Looking for a way to add some extra fun for your guests? 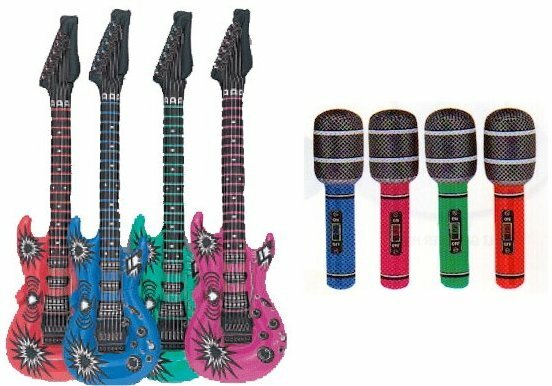 Why not order some inflatable guitars and inflatable microphones for me to hand out to guests at your disco? Instead of having your guests play the air guitar, they can play the air-filled guitar! Singing into the top of a bottle is all well and good, but using an inflatable microphone is much more fun! These items are yours to keep after the disco. The inflatable guitars measure approx 106cm and the inflatable microphones approx 38cm in length. Both products come in a variety of colours and will be pre-inflated before being given to your guests.